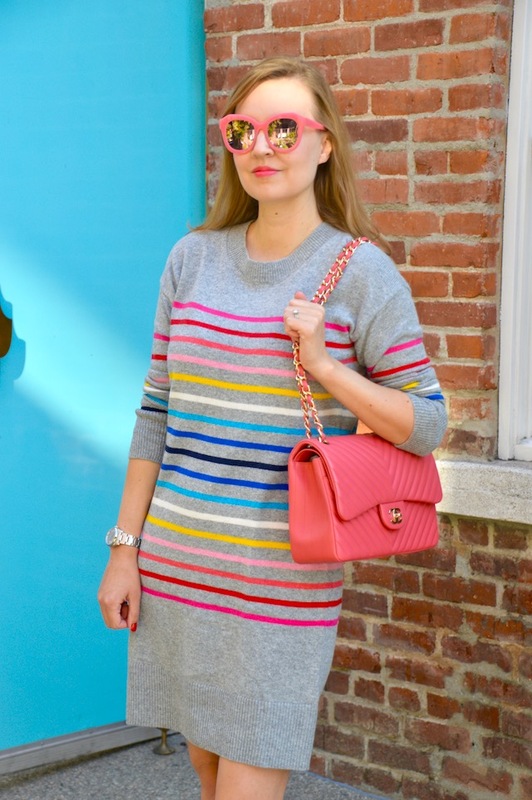 Everyone knows that I am crazy about stripes, especially rainbow stripes, so it only makes sense that I would have to get this sweater dress in what Gap has dubbed as their "crazy stripe" pattern. Gap also has a sweater and even some sneakers in "crazy stripe" so that you can bedeck yourself from head to toe in these crazy, fun rainbow stripes! Also, since Gap's Black Friday sale starts early this week with an extra 50% off your purchase, you can load up on a lot of color for a very small price! In case you were wondering, I also purchased the crazy stripe sneakers because they were just too cute to pass up and they were also a great deal! Originally, I was thinking of going all out and wearing the sneakers with the dress but I thought I would go with my velvet booties instead for a slightly more glamorous look. The bag also helps add a little bit of glamor. If I decide to go out shopping on Black Friday, I could wear this dress styled more casually to deal with the crowds but, on second thought, it might be nice to just stay in and enjoy some leftover turkey instead! 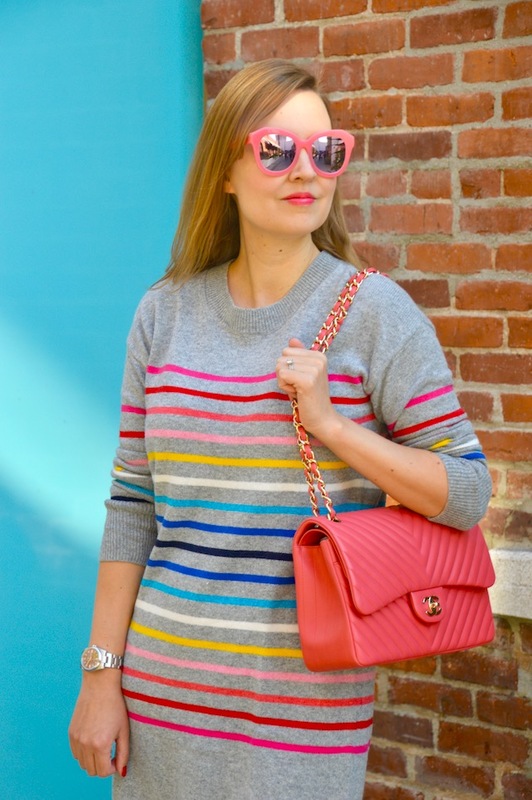 I don't know what it is about stripes but I just can't get enough especially ones with a lot of color! Love that it looks so cozy and warm. Those navy booties are a perfect color complement and let's not get started on the fact it's velvet! Happy Thanksgiving Katie! This dress is so cute! 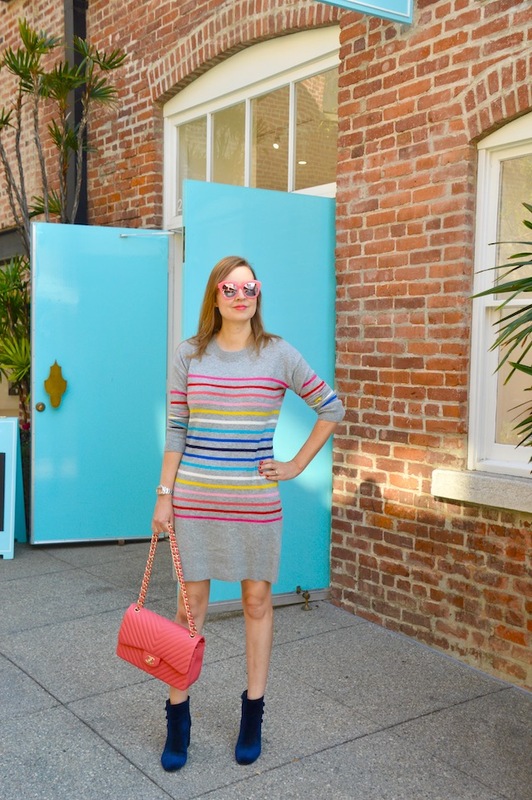 I love the rainbow stripes and those velvet boots compliment it perfectly! I would totally wear this whole look! Happy Thanksgiving! I love it, so lovely and bright!And I adore those boots!! That sweater dress is really cute. I love all the color in those stripes and it's cute with the booties. This look is so darling. I would think the boots would be too dark, but they are very harmonious. 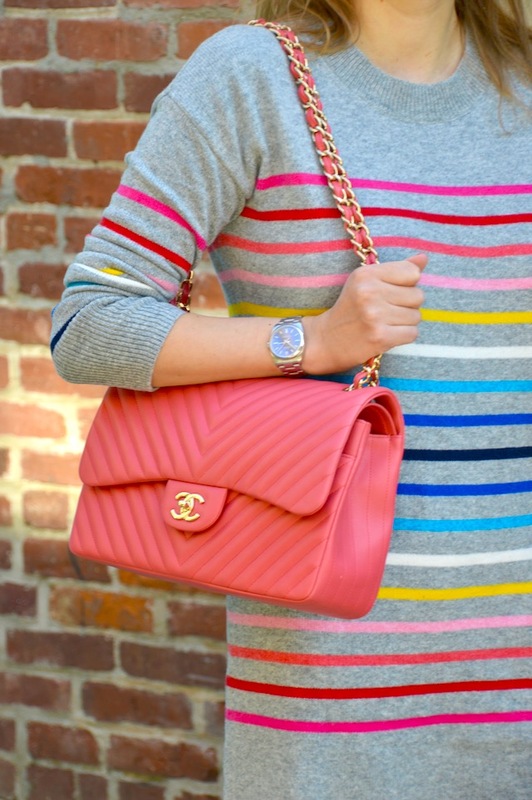 I'm having serious handbag envy! I LOVE sweater dresses! This is perfect for you Katie and that bag is sooo glorious! I love the velvet booties too for additional color.